What Is a Service Set Identifier (SSID)? An SSID (service set identifier) is the primary name associated with an 802.11 wireless local area network (WLAN) including home networks and public hotspots. Client devices use this name to identify and join wireless networks. For example, say you're trying to connect to a wireless network at work or school that's called guestnetwork, but you see several others within range that are called something entirely different. All of the names you see are the SSIDs for those specific networks. On home Wi-Fi networks, a broadband router or broadband modem stores the SSID but allows administrators to change it. Routers can broadcast this name to help wireless clients find the network. The SSID is a case-sensitive text string that can be as long as 32 characters consisting of letters and/or numbers. Within those rules, the SSID can say anything. Router manufacturers set a default SSID for the Wi-Fi unit, such as Linksys, xfinitywifi, NETGEAR, dlink or just default. However, since the SSID can be changed, not all wireless networks have a standard name like that. Wireless devices like phones and laptops scan the local area for networks broadcasting their SSIDs and presents a list of names. A user can initiate a new network connection by picking a name from the list. In addition to obtaining the network's name, a Wi-Fi scan also determines whether each network has wireless security options enabled. In most cases, the device identifies a secured network with a lock symbol next to the SSID. Most wireless devices keep track of the different networks a user joins as well as the connection preferences. In particular, users can set up a device to automatically join networks having certain SSIDs by saving that setting into their profiles. In other words, once connected, the device usually asks if you want to save the network or reconnect automatically in the future. What's more is that you can set up the connection manually without even having access to the network (i.e. you can "connect" to the network from afar so that when in range, the device knows how to log in). Most wireless routers offer the option to disable SSID broadcasting as a means to ostensibly improve Wi-Fi network security since it basically requires the clients to know two passwords: the SSID and the network password. However, the effectiveness of this technique is limited since it's fairly easy to sniff out the SSID from the header of data packets flowing through the router. 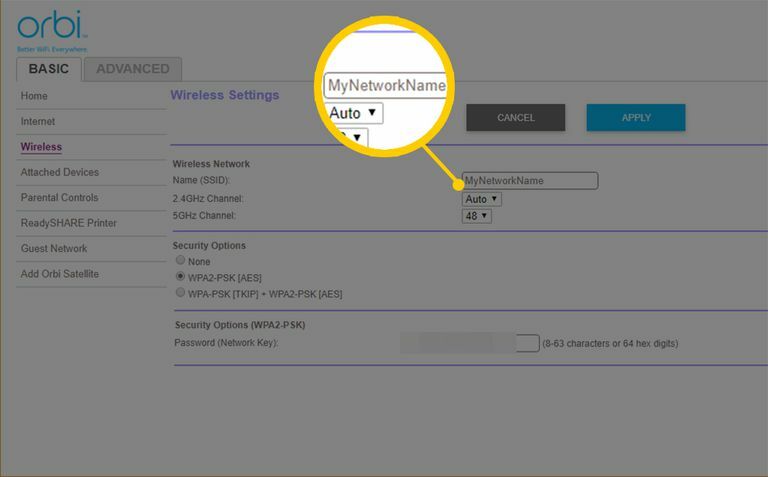 Connecting to networks with SSID broadcast disabled requires the user to have manually created a profile with the name and other connection parameters. If a network does not have wireless security options enabled, anyone can connect to it by knowing only the SSID. Using a default SSID increases the likelihood that another nearby network will have the same name, confusing wireless clients. When a Wi-Fi device discovers two networks with the same name, it will prefer and may try auto-connecting to whichever one has a stronger radio signal, which might be the unwanted choice. In the worst case, a person might get dropped from their own home network and reconnected to a neighbor's who does not have login protection enabled. The SSID chosen for a home network should contain only generic information. Some names (like HackMeIfYouCan) unnecessarily entice thieves to target certain homes and networks over others. An SSID can contain publicly-visible offensive language or coded messages.